Summary: Follow the below guide you can Convert Sony PXW-FS7 XAVC-I/XAVC-L files to Final Cut Pro,Avid,Premiere compatible format easily with the help from XAVC Video Converter Mac. In this article, we will share the guide on how to fast convert Sony PXW-FS7 XAVC-I/XAVC-L video for FCP,Avid,Premiere,FCE,iMovie further editing. If you shot videos with Sony PXW-FS7 used XAVC format unveiled by Sony, there will be some issues when importing and editing the XAVC videos in FCP,Avid,Premiere. And as I know XAVC is a new recording format which can support 4K resolution (4096 * 2160 and 3840 * 2160) at up to 60 fps. However, XAVC is still not so popular and widely used. So when you deal with the PXW-FS7 XAVC-I/XAVC-L video in FCP, Avid, Premiere or other Mac tools FCE, Adobe Premiere Pro, etc, you may encounter some format incompatibility issue. This article is written to help Sony PXW-FS7 users to solve such kind of problems. First all of, you can get UFUWare HD Video Converter for Mac, which is an easy-to-use yet professional XAVC Converter for Mac(Mountain Lion, Mavericks,Yosemite included). With it, you can effortlessly transcode Sony’s new XAVC codec to Final Cut Pro fully compatible format and keep original quality at mean while. This software can export ProRes for Final Cut Pro, Apple InterMedaite Codec(AIC) for iMovie, FCE, DNxHD for Avid Media Composer and more NLE systems for native editing. Here is an easy and efficient solution for you. Run the Sony XAVC-I/XAVC-L to FCP/FCE/iMovie/Avid/Premiere Converter and click “Add file” or “Add from folder” button, browse to the XAVC footages and load them to the converter for conversion. You can check the “Merge into one” box to join several XAVC,MTS files together. 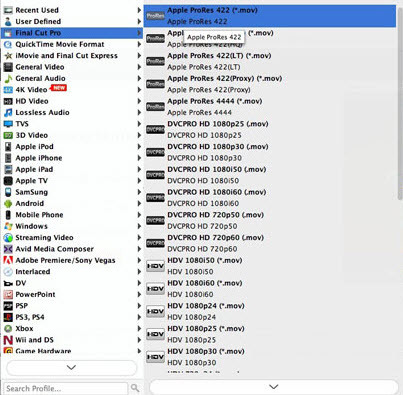 You just need to go to Final Cut Pro column by choosing “Apple ProRes 422 (HQ) (*.mov)” as best video format for editing Sony XAVC-I/XAVC-L in Final Cut Pro,final Cut Express,iMovie,Avid,Premiere with good video quality. When you finish all settings, hit “Convert” button to start XAVC-I/XAVC-L Mac conversion. You can follow the conversion process from the pop-up windows. After the conversion, it will be easy for you to import Sony PXW-FS7 footage into Final Cut Pro 6/7/X,FCE,iMovie,Avid,Premiere for editing or do whatever you want with the converted XAVC-I/XAVC-L footages on Mac OS X. Additional Tip: More than FCP, you can also easily convert Sony PXW-FS7 XAVC-I/XAVC-L to iMovie, Avid, FCE, Premiere Pro, etc with UFUWare HD Converter for Mac.